When it comes to beauty tools, I’m typically pretty devoted. There’s not a ton of back and forth testing of things like hairbrushes, eyelash curlers, makeup brushes and the like. I thought that would be the same with konjac sponges (little vegetable-based cleansing puffs that gently cleanse and exfoliate your skin), but I’ve been finding myself experimenting — and I’m pretty smitten with Yosh Konjac Sponges out of Canada. Handmade in Japan with a global shipping office in Hong Kong and a headquarters in Toronto, Yosh Konjac Sponges have you covered in so many corners of the world — and your face. I love using a konjac sponge during my morning shower with a bit of a creamy cleanser. I feel like I’m getting a nice, gentle cleanse beyond what I can do with my hands and a cream cleanser alone, but it’s never too much for a simple morning cleanse. Because I don’t exfoliate with scrubs or acids every single day, I rely on a good konjac sponge to keep my skin looking radiant without fear of daily irritation. With konjac sponges, it all comes down to texture. Some are too soft and don’t feel like they are really exfoliating. Others are too rough and feel harsh on the skin. Yosh Konjac Sponges, however, have nailed down the perfect texture and sizing. They’re soft and porous, with a bowl-like curve that helps your cleanser stay put and lather, and the fine scrub feeling from these konjac sponges gently exfoliates. 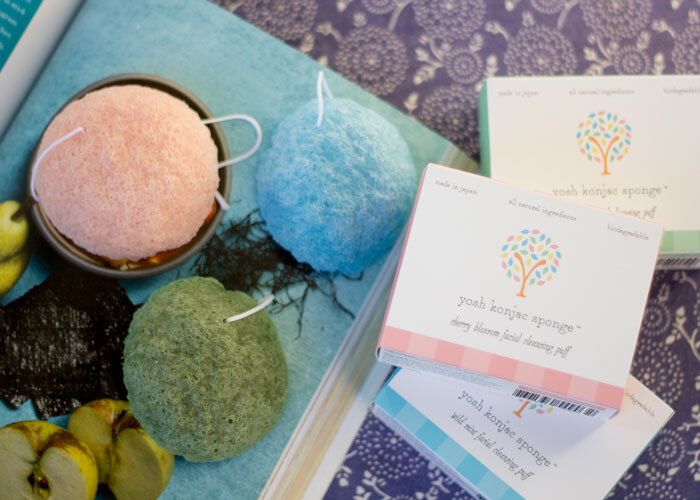 One of the most exciting things about Yosh Konjac Sponges is the availability of different konjac cocktails — meaning the lovely cherry blossom, wild mint and green tea options in addition to the original white konjac sponge, bamboo charcoal and citrus varieties. Though my oily, acne-prone self usually opts for something like bamboo charcoal (my skin responds well to the detoxifying properties of charcoal! ), I stepped out of my comfort zone to try three that were suitable for all skin types (and made for some really colorful photos!). Infused with cherry blossom leaf essence from the Yoshino Cherry Tree, Yosh Konjac Sponge’s Cherry Blossom puff also contains pink clay to help gently detoxify pores without overdrying. In addition to a shot of Japanese peppermint, Yosh Konjac Sponge’s Wild Mint puff has blue clay to help with purging skin of impurities and revealing refined, refreshed skin. 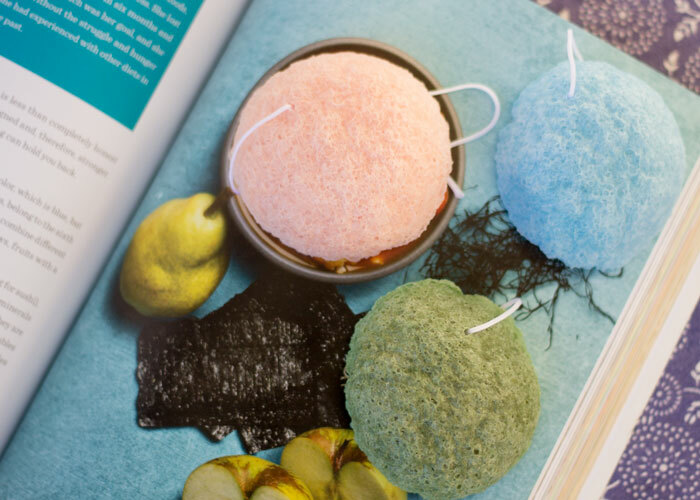 Packed with antioxidants and antibacterial properties, green tea makes this Yosh Konjac Sponge a dream for any skin type, but especially for those of us who are prone to breakouts. Green tea powder aids in reducing the appearance of redness and inflammation while the actual sponge keeps skin smooth. Yosh Konjac Sponges are biodegradable (helps me with the disposable nature of these puffs — I replace mine every few months) with no artificial coloring or preservatives. They’re also not aren’t tested on animals and are made using vegetable fibers from non-GMO konjac pants. My only complaint about Yosh Konjac Sponges? They aren’t yet available in the U.S.! I know I can order them online (remember that whole global shipping thing), but for something like a konjac sponge, I’d love to be able to run into a store to grab it. I love these konjac sponges for their perfect texture and size. Definitely recommend and will repurchase when it’s more convenient for me. Canadian readers, I’m jealous. Have you tried konjac sponges before? What brands and types (charcoal, green tea, etc.) do you like? Tell me in the comments section!